The 23-year-old is one of three rookies on the F1 2019 grid, alongside McLaren's Lando Norris and Williams' George Russell, and has finished in the points in the last two races in Bahrain and China. But the British-born Thai driver does not feel like he has been at a disadvantage despite the late confirmation of his graduation to F1. "Yeah I am [proud]," Albon told Sky F1 after the Chinese GP. "To be honest, Formula 2 itself is a really good stepping stone for Formula 1. Even tyre management and all those things, they're directly related to Formula 2. 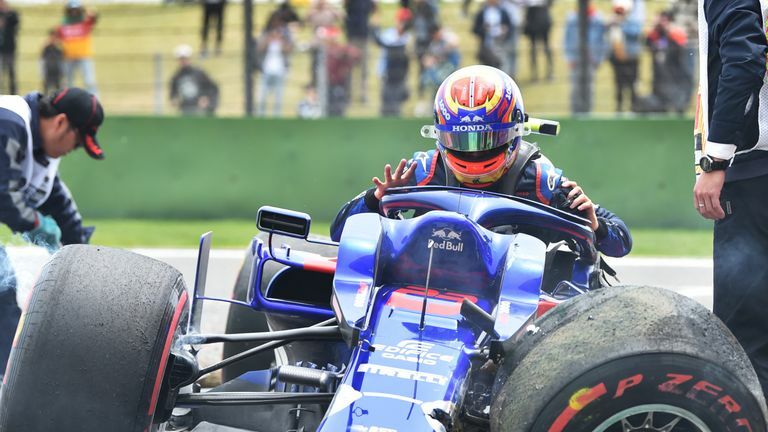 Albon displayed his talents to win Formula 1's 'Driver of the Day' in Sunday's race after finishing 10th, having been forced to start in the pit lane following a huge crash at the final corner in Practice Three. Explaining the crash, he said: "I'd always been pushing that side of the track because it's quicker, you gain entry speed and you don't normally get punished on exit. Normally it spits you once, you get the one slap and then you're away. Toro Rosso have had a driver qualify 13th, 12th and 11th in the opening three grands prix, but Albon feels the team have the pace to be targeting regular Q3 appearances over the remainder of the season. "After FP3 it felt like a really big opportunity missed because the pace was really strong all weekend. I really thought we could have been in it in qualifying, so to be starting from the pit lane…" he added. "I really think so [we can aim for Q3 every race]. Even on Bahrain we should have been in Q3, we had some wing damage otherwise I'm sure we would have been in Q3."